President Vladimir Putin of Russia played the genial host at the Olympic Games in Sochi, but his dangerous approach to geopolitics could be his true legacy, reports nytimes.com. On Friday, Ukraine’s ambassador to the United Nations, Yuriy Sergeyev, said that Russian troops had taken control of two airports in Crimea and that the Russian Navy was blocking the Ukrainian Coast Guard. Moscow denied that it had sent troops in. 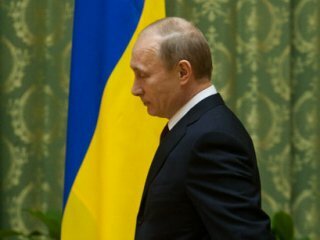 But the fact is, Russia was outrageously provocative when it put 150,000 troops on high alert on Wednesday for war games near Ukraine’s border and then on Friday allowed the deposed Ukrainian president, Viktor Yanukovych, to give a news conference when he showed up in the Russian city Rostov-on-Don. The situation has now gone from chaos to the verge of military confrontation. The pro-Russia region of Crimea is seething, and the new central government that took over in Kiev after Mr. Yanukovych fled is barely functioning. President Obama, speaking at the White House, was right to warn Russia against any military move and to indicate that the United States would join the world in condemning a violation of Ukraine’s sovereignty. He also said that "there will be costs” for any intervention in Ukraine, though it was not clear what, if realistically anything, that might involve. Mr. Obama spoke after armed men of uncertain allegiance took up positions at two airports in Simferopol, the regional capital of Crimea. Their military uniforms bore no insignia, and it was not obvious who they were or who was commanding them. There were no immediate signs of confrontations or panic, but The Times reported that armored personnel carriers with Russian markings appeared on roads outside Simferopol, sometimes alone but at other times in long columns of military vehicles. It was unclear whether the movement was a Russian push to occupy the city, a show of strength or simply a routine rotation of Russian military equipment. Russia has many military facilities in Crimea, where its Black Sea fleet is based, and the area has stronger historical ties to Russia than to Ukraine’s central government in Kiev. While promising to defend the interests of Russian citizens in Ukraine, Moscow has said it will not intervene by force. But whether Mr. Putin will abide by that promise is unclear. In 2008, he sent Russian forces into neighboring Georgia, ostensibly to protect the secessionist Georgian enclave of South Ossetia; the real goal was to weaken the pro-Western government in Tbilisi. Russia and the West both have legitimate interests in Ukraine and its future. Fomenting more tension in a country that is already in upheaval is not in anyone’s interest. Nor is encouraging a permanent break between Crimea and the rest of Ukraine. Russia and the West need to work together to help stabilize the country politically and develop an economic and trade package that will begin to resolve the economic crisis. Mr. Putin’s dangerous tactics are sure to backfire and do more to alienate Ukrainians than to encourage them to accept any Russian role in their nation’s future.